Has anyone done any customization of their window or light options? I would like to have the option of the having the windows all go down when depressing/holding the unlock button on the key remote fob(we do not seem to have the option in the US to get them to go auto up with the lock button on the remote). I would also light to have the light sensitivity increased to that the auto lights come on sooner under medium light situations. Next time I go to the dealer I think I will have them alter these. I wish they did have the option to hold what drive mode was selected last instead of defaulting to normal at every restart. oh well. Had the windows activated for free by the dealer. In my car (hybrid) i can adjust the light sensitivity on the central screen, and the drive mode is saved to the last setting. I always drive in ECO, and never need to re-adjust this. C-HR Hybrid Bi-Tone Hydro Blue / Night Sky Black Premium, full ventilated Nappa leather Exclusive design. the drive mode is saved to the last setting. I always drive in ECO, and never need to re-adjust this. Works fine with ECO but doesn't work with SPORT. My next visit to the dealer I will have my windows/remote option activated and the sensitivity increased for the auto lights. 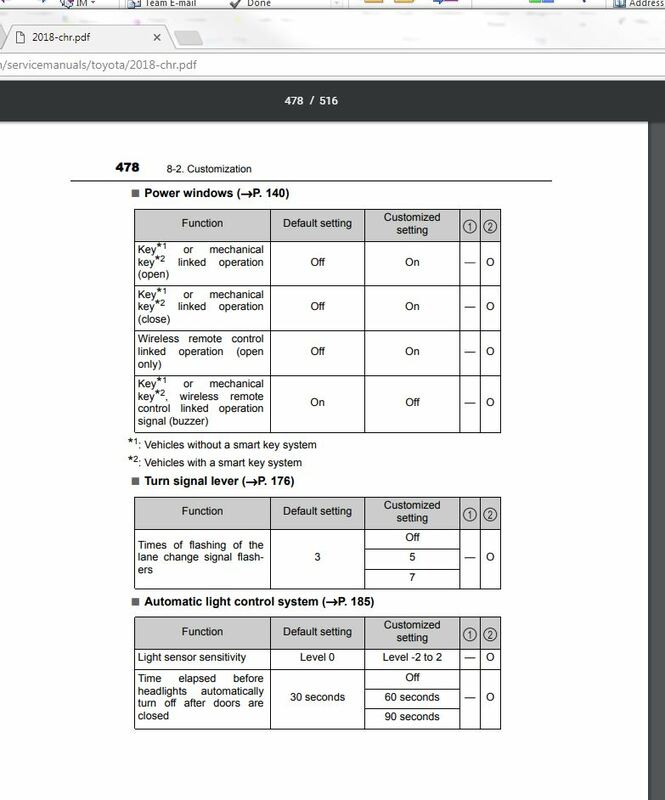 I did check and and there is not an option in the menu in the NA C-HR that I can find for the auto lights to be adjusted . Its a shame that they do different versions for different countries. Some pluses and some minuses to that I suppose. At least for 2019 there are some additional options coming our way. Leather (black and Brown), Nav option, I think we will get the black roof as an option. I see the limited gets some chrome trim which I think is similar if not the same as the European Hybrid trim on the upper part of the outer door trim where it meets the window. I also saw that the reports indicated a red bumper garnish for the limited version. Im assuming its the little red reflector at the bottom of the rear bumper as that was what the invoice called it when they put them on the 2018 US XLE premium models. Just got the blinker indicator set from three blinks to five blinks at the dealer for free. Finally got my windows and light sensitivity completed. Nice for the summer to be able to put the windows down to vent the heat before getting in, that is if its not raining. I'm glad to hear you got this for your 2018, especially from a fellow Floridian. Unfortunately, for my 2019 the option isn't there yet. I just wanted to add on to this thread, and report that after my trip to the dealership today (Central Florida Toyota), they could not find the option in Techstream (ver. 13.30.018) to enable the automatic windows with lock/unlock. The tech was confident that they've done this for other Toyota vehicles, but just couldn't find it for my 2019 Toyota C-HR XLE. They recommended coming back later in the year, after Techstream has received additional updates for my model year. Yeah, I fudged my username. I subconsciously wanted a a "GT-R", and not a "C-HR".